NEW YORK (JTA) – For years, Dr. Rick Hodes has been going about his lifesaving work in Ethiopia with little fanfare but with a loyal following. 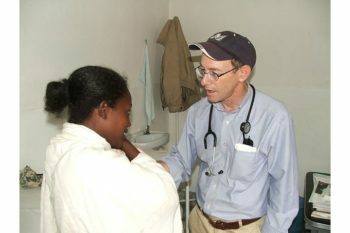 From medical specialists scattered about the United States who offer free consults and sometimes free surgeries for his patients, to the volunteers who have done rounds with him at Mother Teresa’s mission for the dying and destitute in Addis Ababa, Hodes long has been regarded as a lifesaver for otherwise hopeless, sick children in one of the world’s poorest countries. Two-and-a-half years ago, Hodes, who works for the American Jewish Joint Distribution Committee, had his work thrust into the spotlight when CNN selected him as a finalist to be a CNN Hero. A year earlier, Hodes had been the subject of an award-winning 2006 profile story by JTA. Now the subject of a new HBO film and book, Hodes again finds himself in the limelight. With any luck, some very sick Ethiopians with diseases like cancer, rheumatic heart disease and tuberculosis of the spine will benefit. Already, according to Hodes, donors in California and New Jersey have contacted him about sponsoring surgery for a spinal patient — at a cost of about $13,000 per person at the hospital in Ghana that Hodes uses, compared to about $250,000 for the surgery in the United States. But Hodes is not letting the fuss about his work get to his head. For one thing, he claims he hasn’t even read his biography, “This Is a Soul: The Mission of Rick Hodes ,” by Marilyn Berger (Harper Collins, $29.95), which was published in April. The book chronicles the work and journey that Hodes, an assimilated Jew from Long Island, took to arrive at his present station: doctor in Ethiopia, Orthodox Jew and father to a gaggle of Ethiopian children whom he adopted when they were sick or neglected, nursed back to health, and gave a life of opportunities virtually unknown in Ethiopia. The 25-minute documentary by Susan Cohn Rockefeller, “Making the Crooked Straight,” which debuted April 14 on HBO and is available on HBO On Demand until May 15, offers glimpses of this world on film. The documentary is given over entirely to Hodes’ voice. One scene shows the Hodes household during a typical Shabbat dinner: Everyone, from the one-legged Muslim cancer patient who lives there and calls Hodes Dad, to the Orthodox Christian sons he has formally adopted, joins hands to sing “If I had a Hammer” and talk about what they were thankful for that week. Then Hodes pushes back his glasses, holds an ArtScroll siddur to his face and recites Kiddush. Shabbat dinner is the only coercive religious ceremony in Hodes’ multifaith household. Hodes’ family is an unlikely assemblage. Aside from Mohammed, whose chemotherapy after a leg amputation for bone cancer began on Hodes’ front porch, there is Mesfin, an abandoned orphan with growth hormone deficiency. Bayelign, a former child soldier who at 13 became a professional killer, is now a registered nurse and soft-spoken elder brother to the children in Hodes’ household. Bewoket, whom Hodes met in a crowded Ethiopian hospital room when Bewoket could barely breathe, had a heart twice the normal size and was expected to live no more than a couple of months, is now a healthy young man. Adissu, Bewoket’s brother, once a shoeless, illiterate boy from a tiny rural village, is now a college-bound 12th-grader at a Quaker boarding school in Ohio. Today, more than 20 people live in Hodes’ three homes in Addis Ababa. Hodes has formally adopted five children, the legal limit in Ethiopia. Hundreds more Ethiopians owe their lives to Hodes, who spends much of his scant spare time e-mailing photographs and data about his unusual patients to doctors around the world in a bid to find the right specialists, treatments and funding. He also manages the JDC’s clinics in the Ethiopian city of Gondar for thousands of would-be immigrants trying to reach Israel, and he has started a project to build schools and dig wells in rural Ethiopia. Hodes ascribes to God the tremendous good fortune he has had getting world-renowned specialists to join in on his cases. Now an observant Jew, Hodes tells the story about how a chance encounter at a Minneapolis-area synagogue — Hodes had stopped in because he needed a place to put on tefillin and recite his morning prayers — resulted in a pair of lifesaving, free surgeries for patients with massive tumors other doctors had considered inoperable. One of them, a Muslim patient named Merdya Abdisa, had an orange-sized tumor removed from her eye at a Catholic hospital in St. Paul by the Orthodox Jewish doctor Hodes met at the shul, Eric Nussbaum. 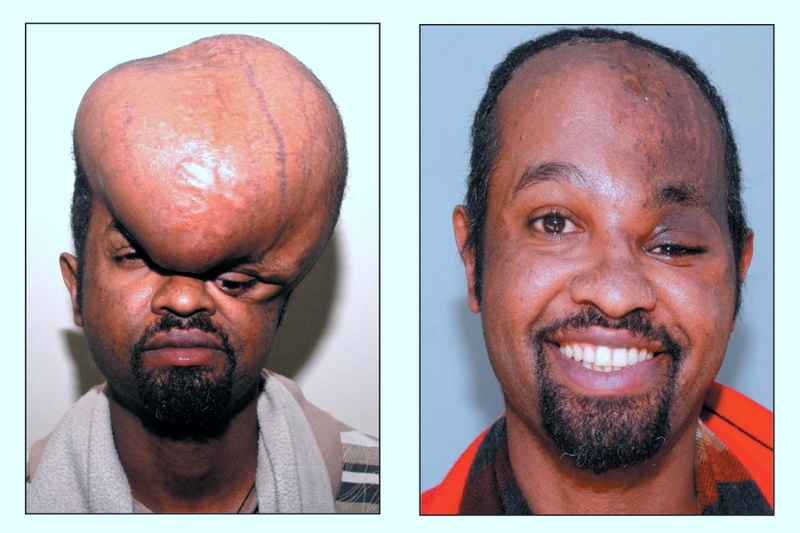 Nussbaum also operated on Dawit, who had a 7 1/2-pound tumor growing out of his forehead. Today Dawit is free of the tumor and is back in Ethiopia getting chemotherapy. “For those of us who put on tefillin, if you had said to me that morning, ‘Rick, if you put on tefillin today you’ll save the life of a Muslim patient,’ I’d have said you were nuts,” Hodes told JTA. Berger’s book on Hodes is filled with similar stories, and it fills in the details about a doctor and Fulbright scholar whose quest for fulfillment took him from medical school at the University of Rochester, in upstate New York, to volunteering at a clinic in India to Aish HaTorah yeshiva in Jerusalem and, finally, to Ethiopia in 1990 on a six-week mission for the JDC. Two decades on, he’s still there. For Hodes, the book and film are just two more avenues that might help his patients get help. In an interview ostensibly about the publicity surrounding his work, Hodes quickly steers the conversation to his patients — and how little money it takes to save lives in Ethiopia. Hodes’ lobbying for patients never takes a break.